GeeStar is 5' 7", 175 pounds of pure aggressiveness in the ring. You won't find this indy wrestler rolling around the arena floor pulling hair and catfighting with her opponent's manager or valet. GeeStar simply steps onto the mat and goes all-out...usually steam rolling over the competition. This woman approaches wrestling with a single-minded purpose and does whatever is needed to get the victory: power moves, highly-technical maneuvers and even some high-flying tactics are part of this lady's arsenal. GeeStar throws everything she's got at an opponent, female or male, every time she steps into the ring. GeeStar is one of the most dominant women on the Mid-Atlantic indy scene. GeeStar is held aloft by her teammates after becoming the first woman ever to win the Mid-Atlantic TV Title. GeeStar isn't afraid to mix it up with the men...as this poor guy is finding out! How It Started: I had grown up watching wrestling with my daddy and had been a fan, off and on, my whole life. I began dating my now-fiance in 1999, when he was already involved with independent wrestling. I began training under the guidance of the Gemini Kid in March, 2001. I was lucky enough to be chosen to participate on my first show not long after that and nearly got my head clotheslined off by the then CWF/FWA-Carolinas Heavyweight champion Jeff Justice! Gimmick: GeeStar is really just an abbreviation of my real name and the character is just an extension of myself. Whether I'm a heel or a baby (as I typically am nowadays), I'm simply here to bring both respect and wrestling back to the female division! Wrestling Style: I enjoy old school. Telling a story within a match is a true art. I completely respect every style, old-school is just my all time favorite. Gear: Black wingtip boots with the Japanese symbol for star; a black skirt; a shiny silver sleeveless shirt that also has the Japanese star logo. I have also recently added armbands as well! Titles Held: Mid-Atlantic TV Champion (2004); NEW National Title (2002); ACW Women's Title (2003/2004); SWA Women's Title (2002). 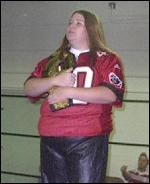 Biggest Win: I don't think anything can get much bigger than becoming the first-ever woman to win the Mid-Atlantic TV Title on April 17, 2004 when I pinned Xsiris in front of the loudest, most emotional crowd I've ever wrestled in front of. Worst Loss: Getting pinned by Amber Holly in our first singles meeting in Carthage, NC in September, 2001. Favorite Type of Match: ANYTHING but a catfight. Mixed tags are lots of fun...but as long as it involves actual wrestling, it doesn't really matter. Finisher: The "GVD": my version of the Death Valley Driver. My submission finisher: the Praying Mantis STF. I also frequently use the Gannosuke Clutch. Biggest Allies: In the ring: Brass Munkey; Rock-n-Roll Matty Dee. Outside the ring: Grant Sawyer; Jeff Rudd; Danny Winkel; Michael Norris; Kim Davis; Chris Flagler; Erica Kinley; Bob "Pac" Dotsie; and my wonderfully supportive family. Most-Hated Enemies: Time will probably show that my feud with the United Nations of Devestation (Drake Tungsten and Hugh B. Johnson) was one of the most heated of my career...not too mention my long-standing rivalry with manager Brad Stutts. Career Highlight: Wrestling in Memphis Coliseum in October of 2004 will forever be remembered by me. It was the day that Team Blondage was to debut and Madam Gee even appeared on TV earlier that day with Team Blondage. Unfortunately, one of the girls scheduled to wrestle couldn't make it, so I was asked to fill-in. I actually ended up wrestling Amber and Krissy in front of about 3000 people and got a great response from the crowd! Favorite Wrestlers: It's so tough to pick just one! Growing up as a kid it was Nikita Koloff, the Rock N' Roll Express and Ricky Steamboat. Now, as far as today's stars, I enjoy watching Chris Benoit, Satoshi Kojima, and Kenta Kobashi. Wrestling Ambition: I could sit here and say "My dream is WWE"...but that would be a lie. My only ambition in this sport is to have fun. When I stop having fun, I'll hang up the boots. Outside the ring, my biggest love is definitely my animals. I currently have one ferret (Ricki) and eight (OMG!) cats. But every one of them are special and I couldnt imagine life without them! I've owned just about every animal there is over the years and I've always been interested in veternary medicine.....I try a wide variety of hair styles for my matches so there's no telling which version of GeeStar you will get on any given night.....I listen to just about every kind of music under the sun from rock to rap to country to classical. Right now, I am REALLY into My Chemical Romance. GREAT BAND!.....I love a good NFL game!.....For any of my fans that wish to contact me, you can always do so at GeeStarFWA@aol.com.